This book was recommended to me while visiting Fuller Baptist Church in Kettering, England. 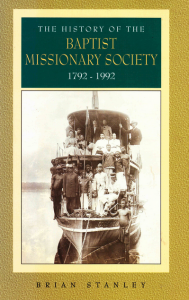 Stanley, lecturer of Church History at Trinity College, Bristol, has done an amazingly detailed job of presenting the history of the missionary society of Carey, Fuller, and others. Though my interest in more of the early years when these men got the burden and started the BMS in the 1700s in the Midlands of England, this book covers the society’s history to our times. Because this is the case, much of the history is also of the Baptist Union, still awash in the ecumenicalism and compromise of the last one hundred years (this is the association that Spurgeon described as on the “downgrade”). Perhaps the lesson for our own generation is that great movements are not guaranteed perpetually strong conviction beyond the life-time of its founders.